Vintage 1960s ROOSTER Flat Bottom Tie! ochre, Red, Cinnamon & Black Duck Motif! 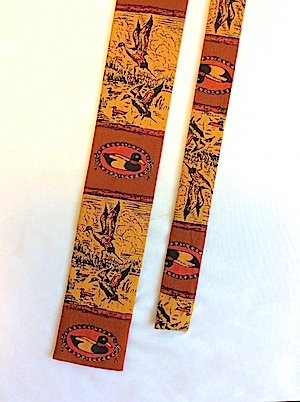 Home > Men's Accessories > Vintage Ties & Bowties 1930s-1960s > Vintage 1960s ROOSTER Flat Bottom Tie! ochre, Red, Cinnamon & Black Duck Motif! Wonderful vintage 1960s flat bottomed tie, made by Rooster. All cotton. "Hand Printed Exclusively for Rooster by Sun Fabrics". Sold by Powers Men's Shop Minneapolis. Alternating wide bands of gold and orangey-red-brown. Print of ducks. A Mallard (I think) done in gold and brown in a reddish oval with rope outline. And 2 geese (ducks?) in flight over a marsh. Very nice looking tie. Excellent vintage tie!